O.K. 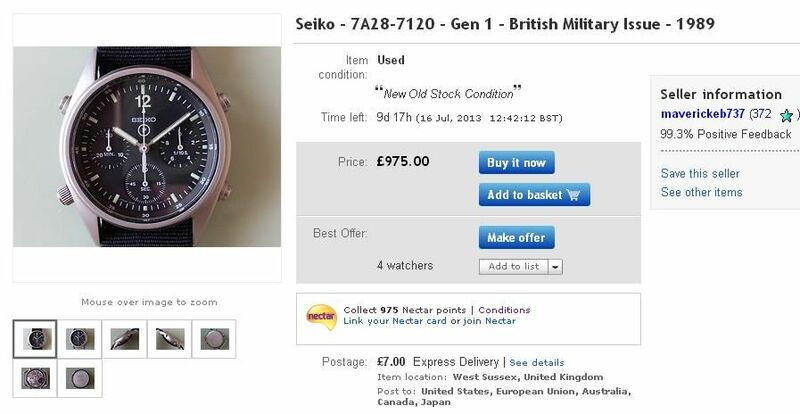 so they're not my cuppa tea; I'll never understand the attraction myself, but there are plenty of other collectors out there, of both Seiko and 'military' watches who are prepared to pay £400-£500 (sometimes upwards) for beaten up examples of 7A28 RAF Gen 1's. RECENTLY TOOK THE WATCH TO A JEWELERS WHO REPLACED THE BATTERY AND GAVE THE WATCH A THOROUGH CHECK. HE PRONOUNCED IT IN EXCELLENT WORKING ORDER! ALL 3 BUTTONS WORK AS ADVERTISED WITH SPLIT LAP TIMER FUNCTIONS ETC. HOWEVER THE MINUTE COUNTER (SMALL DIAL IN THE 9 O'CLOCK POSITION) FOR THE STOP WATCH FUNCTION HAS PROVEN TO BE TEMPREMENTAL - SOMETIMES IN STOP WATCH MODE THE COUNTER DOES NOT COUNT THE MINUTES - SOMETIMES IT DOES! 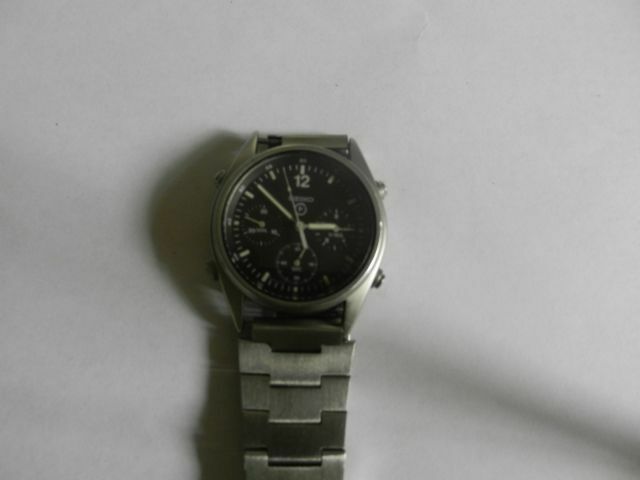 WATCH IS IN OVERALL GOOD CONDITION WITH GOOD CONDITION STAINLESS STEEL WITH LIGHT SCRATCHES AND VERY LIGHT SCRATCHES ON THE WATCH FACE. 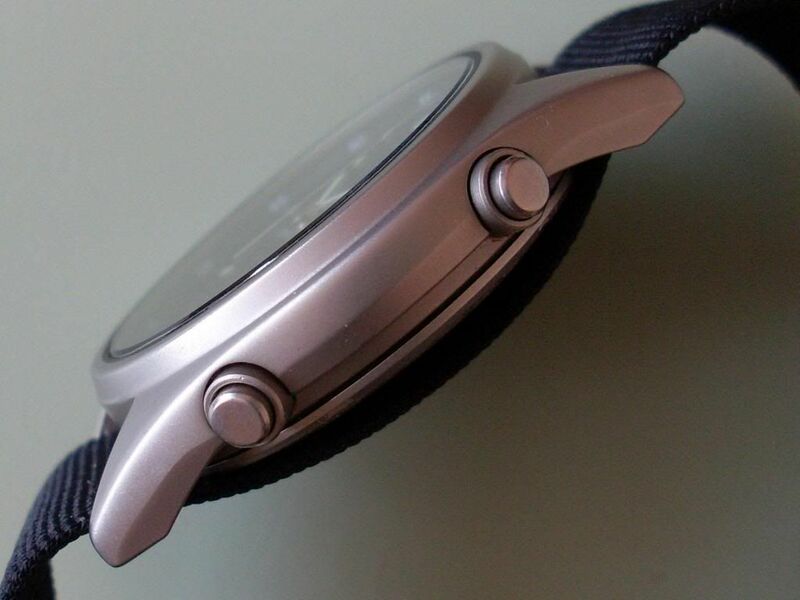 WATCH KEEPS NEAR PERFECT TIME AND ALMOST NEVER NEEDS ADJUSTMENT. I WILL USE SPECIAL DELIVERY IN THE UK AND TRACKED SERVICE TO SEND OVERSEAS. That one ended 24 hours later @ £442 after 13 bids. The auction received 666 views over the 10-day listing period. 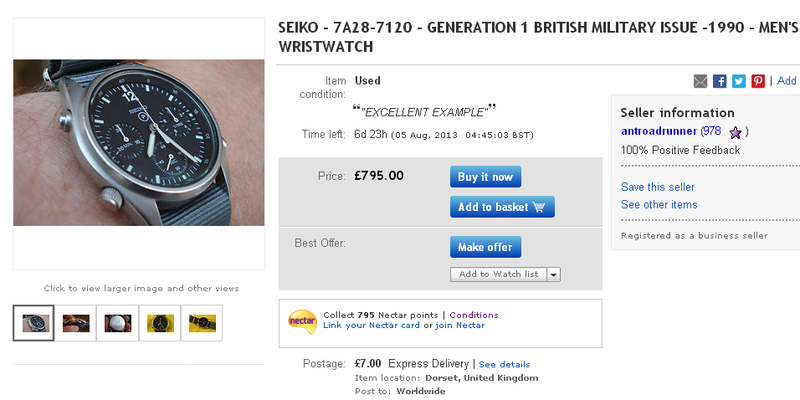 This auction is for my Seiko Gen.1 military chronograph from 1986. 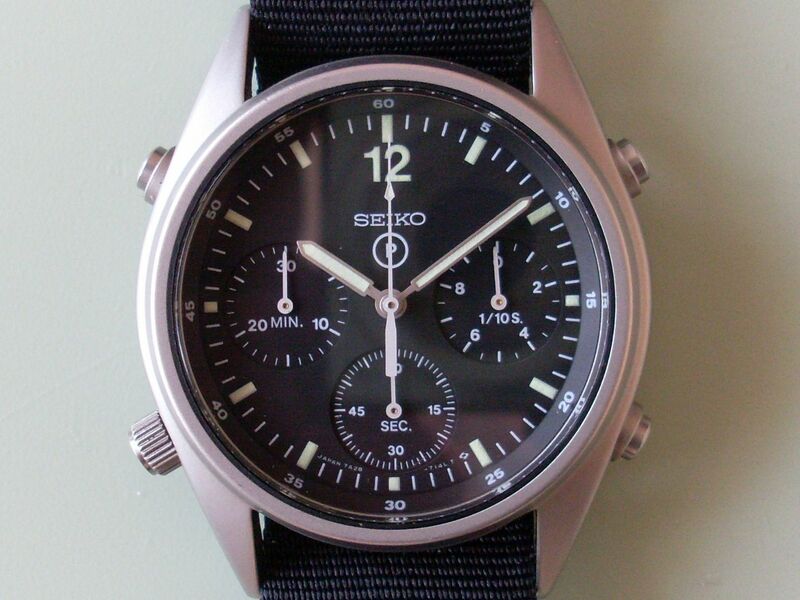 I bought this watch a couple of years ago following a full service & glass replacement by Seiko (receipt will be included in sale). I always liked the look of this watch but have decided it is too nice to just keep in a drawer & to risky to wear daily, hence the sale. 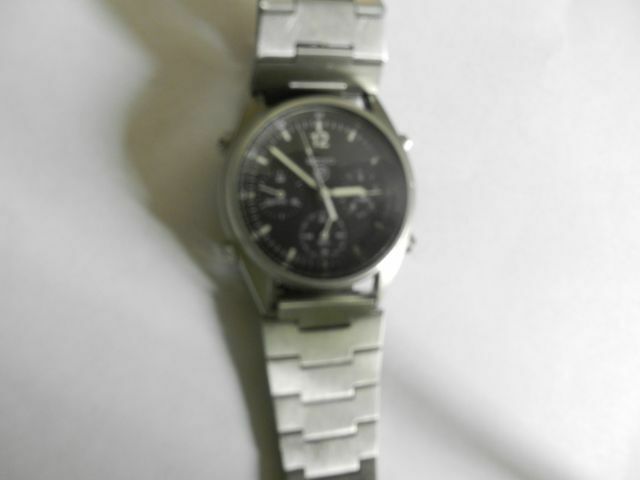 The watch is in very good condition for its age with only minor scratches around the bezel & on the reverse. These watches have quite often seen a hard life & many look a bit worse for wear these days. Some people are of the opinion that signs of a hard life add to the character & authenticity but that is down to personal taste. The glass has a couple of very light scratches & one slightly deeper scratch, all of which I would guess could be removed via polishing. I will also include a used grey NATO strap with satin loops & buckle & a brand new black NATO strap with satin black metalwork. Both recently purchased from TSS (The Strap Shop). So what do you think about this NOS condition example, listed earlier today with a cool £975 price tag ? This watch with issue marks for 1989 appears to be unused and still has the original plastic protector on the case back. A new power cell was fitted 4 weeks ago and it has been rigorously tested, all functions work correctly. Please study the images carefully as they are form of the description. 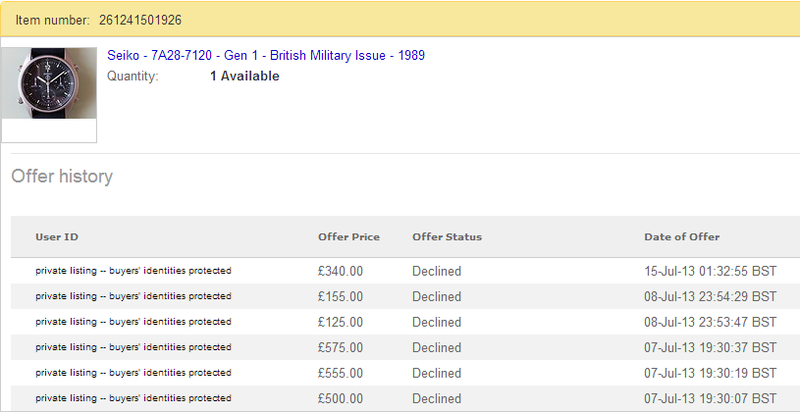 We've all see plenty of 7A28-7120 RAF Gen 1's going for £500, but isn't £799 pushing it - even for the most ardent military buff ? Unfortunately the listing has long since dropped off eBay history and I don't appear to have recorded the price it subsequently sold for. http://www.ebay.co.uk/itm/221200359790 (Private Listing; 3 days duration, received 358 views). 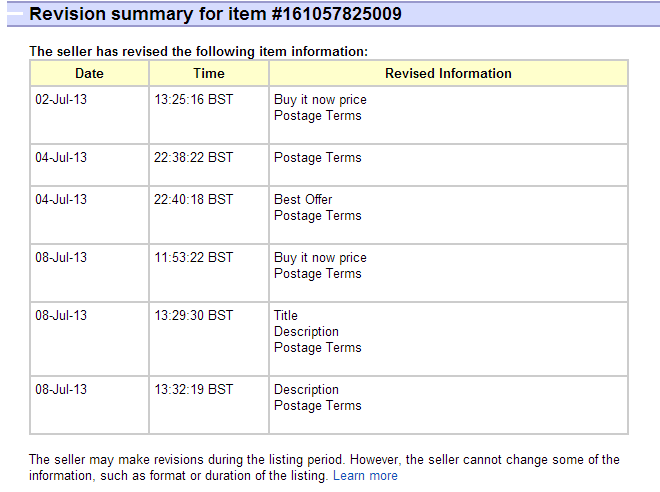 http://www.ebay.co.uk/itm/281076507342 (Normal listing, but images now lost, 10 days duration, received 1234 views). I suppose now I've started this thread, I ought to keep it updated with a few sales results, for the time being, at least. Two eBay listings for 7A28-7120 RAF Gen. 1's that I'd mentioned in my first two posts ended recently. Potential buyers were conspicuous by their absence; the highest of 6 offers it attracted over the 10-day listing period was only £575. http://www.ebay.co.uk/itm/261247986927 Note the current absence of a Make Best Offer button. Wishful thinking on the seller's part ? Much to my surprise, it sold this afternoon for that £900 Buy-it-Now price. Gotta be some kind of record for a 7A28 RAF Gen. 1. Rarely seen ? Erm with 11,300 produced and regular almost weekly new appearances on eBay - I don't think so somehow. "Well if that 'NOS condition' one can sell for £900, mine's gotta be worth £850 (to some mug punter)". 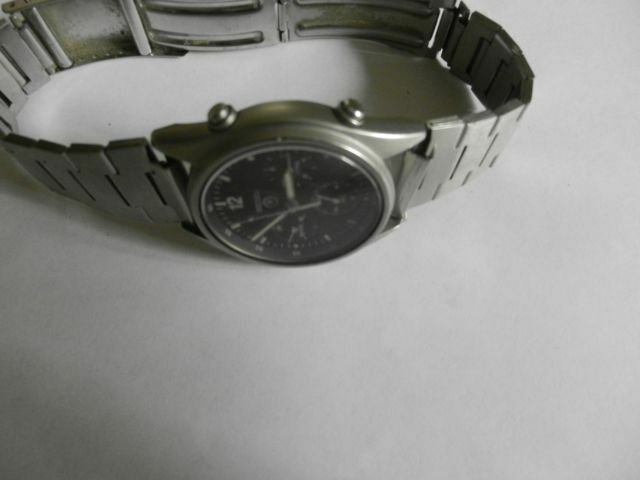 THIS WATCH WITH ISSUE MARKS FOR 1990 IN EXCELLENT USED CONDITION. But do as he says and look closely at the photos. 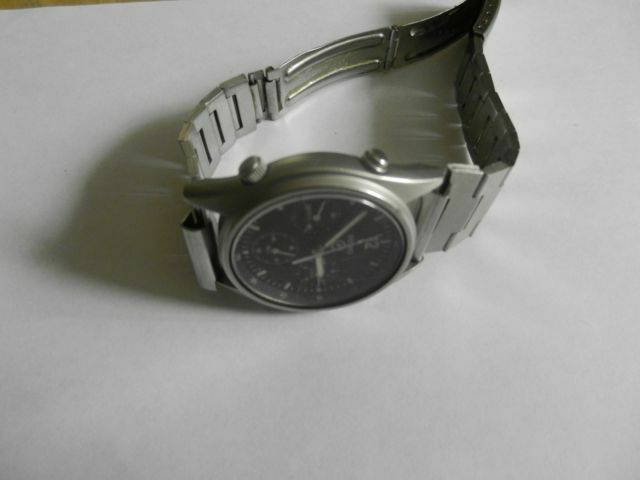 This watch is not in the same league as far as condition goes. Not even close. 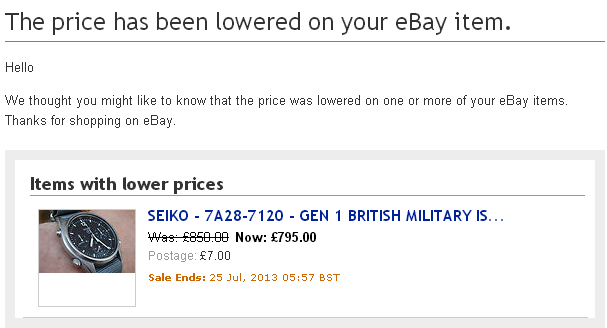 So to the other end of the pricing spectrum - a 7A28-7120 RAF Gen. 1 with an opening bid price of £0.99. Something you don't often see. In case you might have thought I'd missed this one, because I hadn't mentioned it earlier in the thread - I hadn't. I first saw it a week ago, less than an hour after it was listed. For some perverse reason, don't ask me why, I thought, for a while at least, about having a go at it myself. I even sent the seller a tongue-in-cheek message asking if they had a Buy-it-Now price. They didn't seem to have much idea. 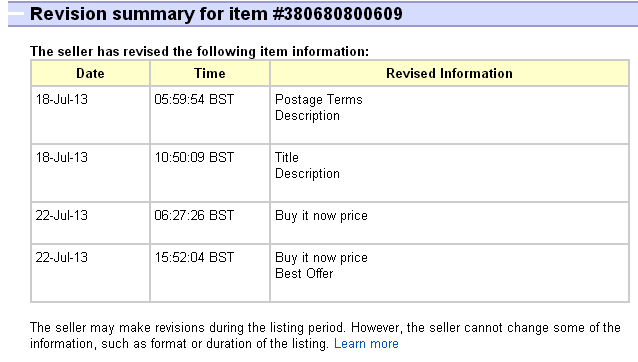 Bidding got under way and I chucked in a few half-hearted bids, still thinking about following through at the end, but when the seller added that amendment to the description, the day before yesterday, I made my mind up that I really couldn't be arsed. 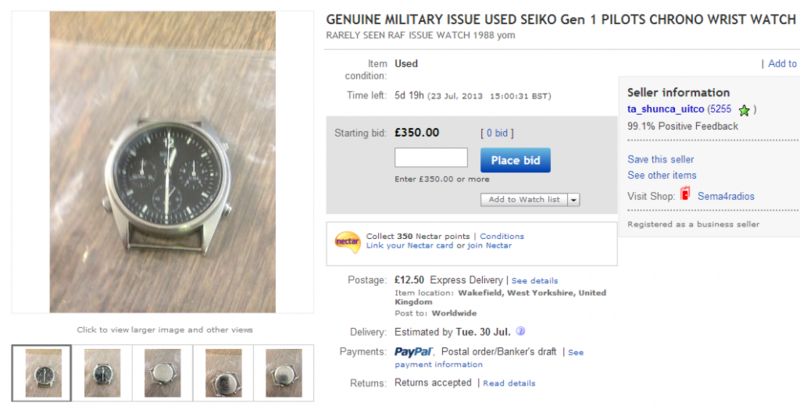 Vintage Seiko Military watch in generally good used condition. 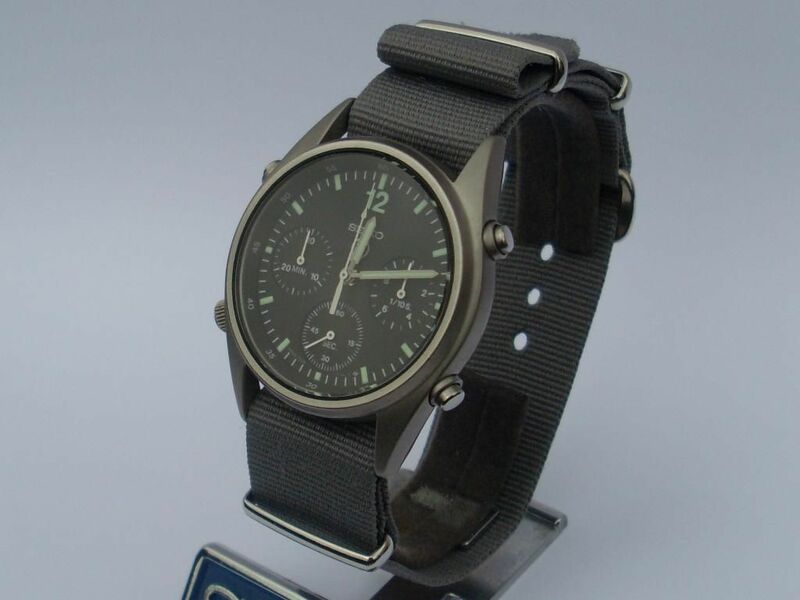 We know very little about this, but after looking it up we think it is a Gen 1 Military RAF issued watch- possibly pilot/ field gear. There are scratches to the glass surface. 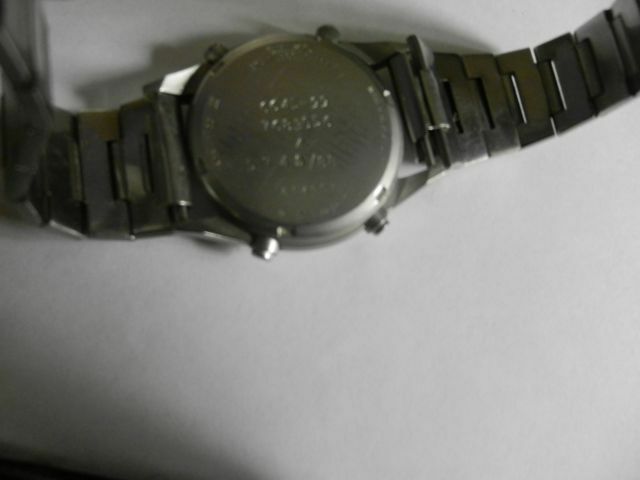 This watch has been stored for years and is untested, we have had the battery replaced by a jeweller and it immediately responded after pushing in the buttons at either side. The only problem is we do not know how to set this watch and neither did the jeweller, but someone with know how would hopefully have an idea. 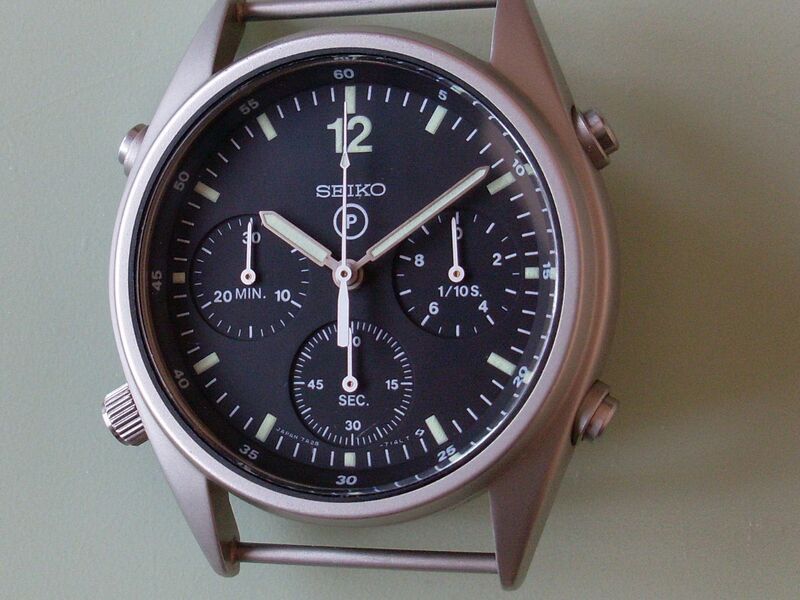 The face is black with Seiko and a P in a circle underneath. The hands and the No 12 at the top and every 5 mins are luminous. Around the edge of the dial has numbers 5 , 10 , 15 and so on to 60. There are 3 dials , the one on the left says 10,20 and 30 with Min in the middle and has a hand. The one on the right says 1/10 S and has no's 0, 2, up to 8. The bottom dial has sec in the middle and has intervals from 15 to 60. 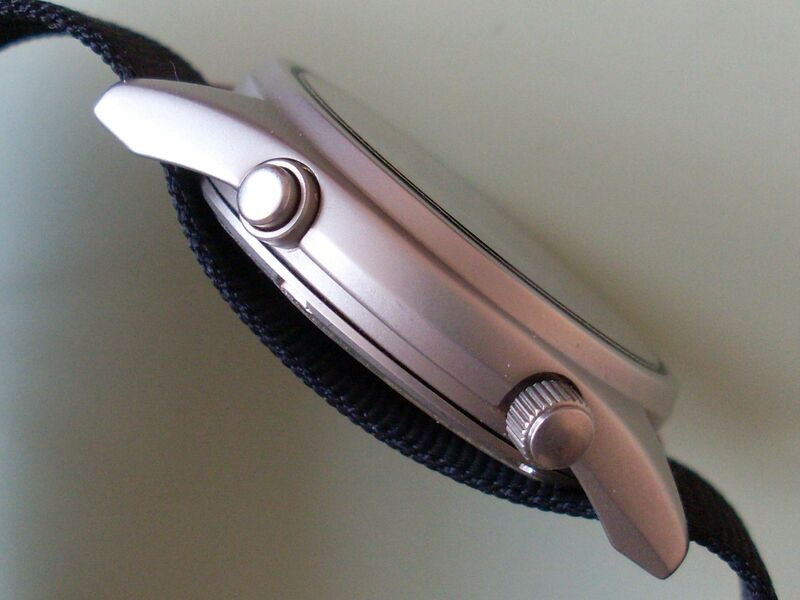 Says 100 percent stainless steel watch strap with a snap type fastener(The strap has fine surface scratches.) 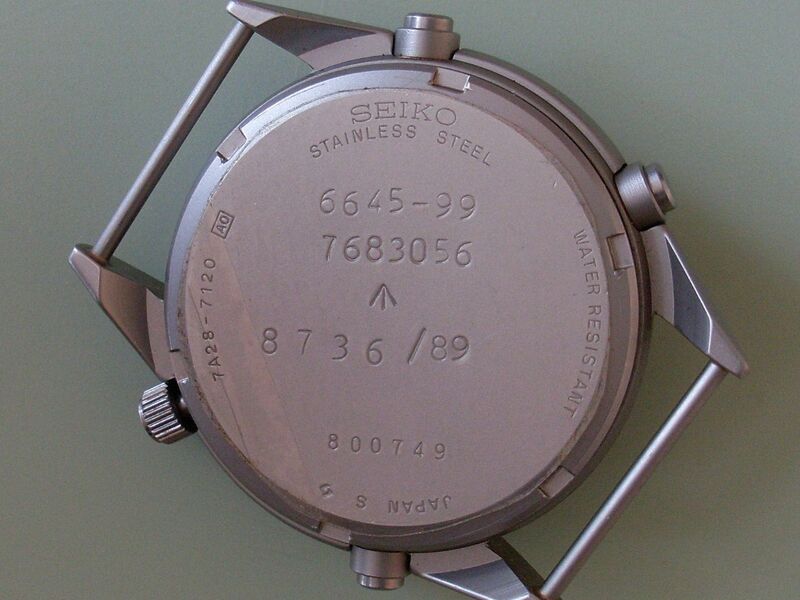 The back says Seiko stainless steel 7A28-7120 and AO in a rectangular box, then 6645-99 7683056 and an upward pointing arrow and below 5745/88 and under that is 814007and the Japan s and a mark that looks like two comma's opposite each other. Watch also states water resistant, but more likely if you splash it- not sure about that or how accurate that is. We are not experts, so please take all information from the photographs or email for any clarification. We would just like to update that the bottom 6 o'clock dial on this watch is not working, therefore, this means it is not moving the hour and minute hand forward,even though the other two dials appear to be working. Diabolical photos. Then there was that bracelet fitted - what damage might have been done to the fixed spring bars ? Maybe it was actually in half-decent cosmetic condition. Who knows ? Up until the final minute bidding had stalled at £155, and I was wondering whether I was letting a bargain slip through my fingers, but then the snipe bids started coming in. It ended at £275 after 21 bids. Obviously, to help me comment on auction / sales results, I've been adding these 7A28-7120 RAF Gen. 1's to my eBay watching page. Damned nuisance it is too, with all the other stuff I'd rather be watching, particularly as I'm perilously close to the 200 items limit again. Thought to myself 'Meh', and deleted it. Just going through my eBay watching page list tonight, and had to do a double-take. Nope. I'm not going daft. But the would-be seller appears to be suffering a bout of 'Martinachertok' madness. It sold for £435.73 after only 3 bids. The last 2 bids came in the final 5 seconds, the winner sniper taking it by a margin of 73 pence ! The auction received 270 views over the 10-day listing period. Well, I'm blowed - another 'Rarely Seen' 7A28-7120 RAF Gen. 1 from the same eBay seller. Different watch, but virtually identical description (same typo's), save for serial numbers and same opening bid price as before of £350. And subsequently ended early yesterday evening (having received two low-ball offers) - presumably the error was in the pricing. Because it's back again this morning - now reduced to 'only' £795. 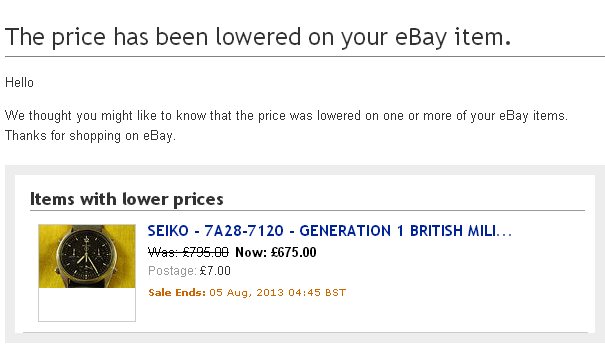 Earlier this afternoon I received another email notification of a further price reduction from £795 to 'only' £695. That re-listing was ended early (again) because of another alleged error in the listing. The auction received 295 views over the 10-day listing period. As with this seller's previous listing there were only 2 bids placed, both in the final seconds. It sold for £386.76. Well, I'm blowed - another 'Rarely Seen' 7A28-7120 RAF Gen. 1 from the same eBay seller. This one's the 4th he's listed ! I have read on different forums to get information also, given this great thought, no haven't been in the army, but why do they sell for such a price? 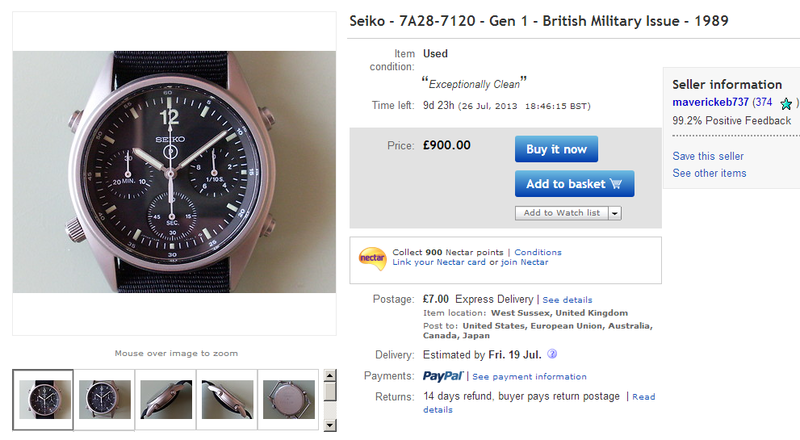 Because Military watch collectors are prepared to pay a premium for genuinely issued watches, so they tend to drive up market prices. Pretty simple really, but still makes no sense to me, when a stainless 7A38-7270 may sell for only a quarter the price of a 7A28-7120.